In a large high sided skillet over medium high heat add a little bit of olive oil and sausage. Crumble and brown sausage. Once cooked, use a slotted spoon to transfer meat into a bowl. Set aside. Remove any grease left in the pot. Drizzle in olive oil and add shallots. Cook until shallots soften then add red pepper flakes. Stir to combine then season with salt and pepper. Pour the white wine and let it bubble and reduce. About 2 minutes. Add in spaghetti, cooked sausage and parsley. Use a pair of tongs to incorporate all the ingredients. At this point the pasta is ready. Check for seasoning before serving. 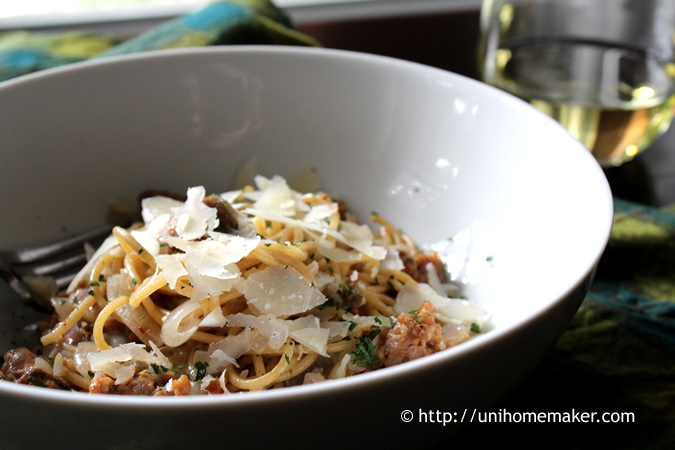 Garnish each bowl with additional chopped parsley and shaved parmesan cheese. Your pictures are so lovely! I have this experience about once a week in my house, my fiance has lovingly dubbed dinners like this ‘Kitchen Sink Pasta’ because I throw in whatever I have left! Now, this is the sort of pasta dish that I love so much: it has everything in it what I want! 🙂 Yummm! Lovely way of cleaning out the fridge. 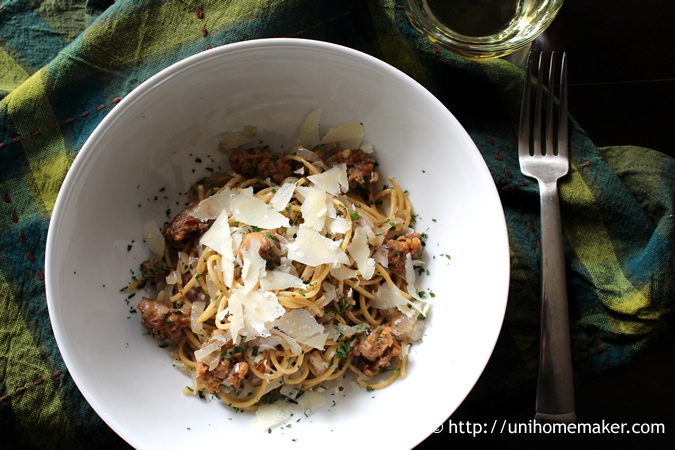 This pasta looks simple and delicious, and I love the addition of wine! Yum that makes me hungry! Mmm looks tasty. You’re making me regret going for an healthy option tonight lol. Thanks Sarah! Always lovely to hear from you. – Do love the photo with you holding the fork. Really must try using that idea at some stage. Unfortunately my hands tremble slightly so I may not get the shot. Still, want to give it a go as it looks so good on here. Looks truly yummy!! I “pinned” it !! As always, your photos are amazing! To me, the red pepper flakes is what makes this dish taste so good. It’s very subtle, but the heat plus the sweetness of the shallots and then the salty cheese…oh man it was good! I did something similar just 2 days ago. We’re trying to finish up stuff from our freezer because I have the habit of overstocking and end up forgetting about them. So many packets of minced beef and chicken tenders. It’s oddly satisfying when you make something delicious using very limited ingredients, right? It’s satisfying if it’s good. Luckily it was. I would hate for it to end up in the trash if it tasted badly. The dish was “tasty and quick.” Two adjectives that I love to use when fixing pasta, Anne. It makes me wonder why I’ve so many spices in a cabinet when something this tasty can be made with so few? Well done! Ooh yum! Sometimes these ‘use up’ dinners turn out to be the best! The sun finally came out today –yay! So it’s spring after all! Thank you so much! It was tasty. 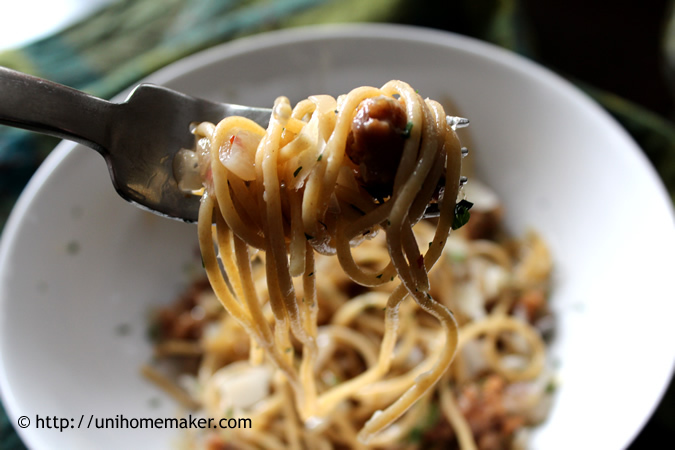 I love quick and scrumptious recipe like this…using up whatever we have on hand and let the flavors married each other. 🙂 I would love to have this any day of the week. Sometimes we can create our best dishes when we have limited ingredients. Your sausage pasta sounds delicious. I wish you could send some over, that looks delicious! That looks super delicious! Don’t you just love it when you just grab what’s on-hand and it turns out great? Sure do! Thanks for stopping by. Oh this looks so satisfying! Impromptu fridge clean outs lead to the best dinners, always! What an amazing thing to do with leftovers, I can’t wait to try this recipe. Your pictures are beautiful, love your blog! Fantastic! I love a simple dish that uses up whatever you happen to have on hand. Sorry to hear you ran out of garlic though! Yummy that makes me hungry! Yum! 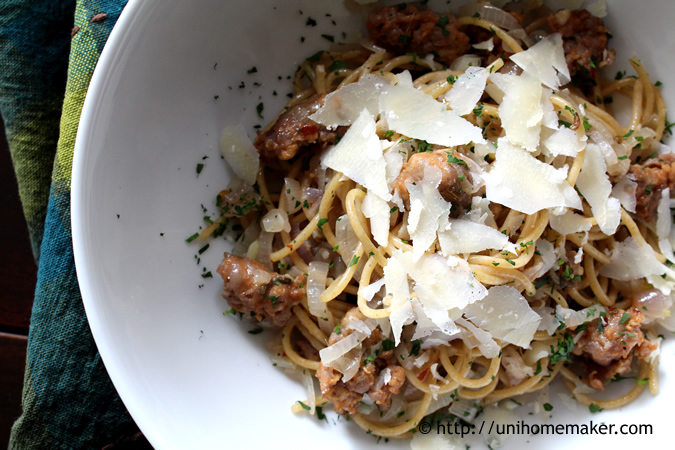 Simple and awesome – the sausages are almost always good enough dressed up in a simple pasta. Bravo, the addition of chilli flakes is my favourite too!